:Jonathan Edwards is widely hailed as the greatest theologian in American history. However, despite the recent surge of scholarship related to his life and theology, few books offer an accessible introduction to his understanding of the Christian life. 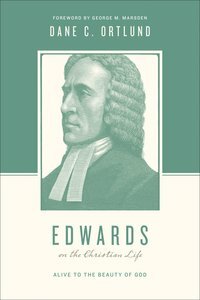 In the latest addition to the Theologians on the Christian Life series, readers are invited to explore Edwards's vision of what it means to be a Christian. Whether it's Edwards's understanding of love, Scripture, the soul, or the natural world, Dane Ortlund shows how the concept of beauty serves as the integrating motif underlying every aspect of his thinking. Clear, concise, and engaging, this book will help readers embrace the great eighteenth-century pastor's definition of authentic Christianity: the enjoyment and reflection of the beauty of God. About "Edwards on the Christian Life - Alive to the Beauty of God (Theologians On The Christian Life Series)"